For those interested in the history of PICTFOR, member Philip Virgo has laid out the format and impact of our predecessor group – briefly outlining our illustrious origins. 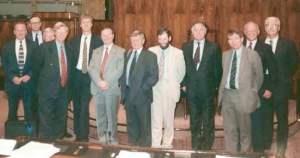 The Parliamentary Information Technology Committee (PITCOM) was formed in January 1981 by merging the All-Party IT Committee, akin to a current APPG, and the Parliamentary Computer Forum, which structured debate between industry experts on hot topics and sent two page digests to all MPs. The new organisation had parliamentary, industry and individual members, an elected council and a programme committee. The work was done by the industry members guided by administrative secretary Frank Richardson. The programme was geared towards imparting informed awareness of the potential and the limitations of tech including industrial, economic and social impact and advantages. The MPs did not want suppliers and academics merely selling them the wonders of new technology. They wanted to hear how it worked in practice from users. They also wanted to hear experts arguing succinctly in front of them about the issues of the day. Opening speakers were limited to ten minutes, though they could table material for follow up. We would then line up four or five contributors from the floor (limited to three minutes each) to start the discussion. If it was too cosy, I was tasked to serve as Devil’s Advocate, saving MPs the embarrassment of asking about the state of the Emperor’s underwear. I had responsibility at the National Computing Centre for their technology assessment operations, giving me access to excellent sources and no need to be nice to potential clients. During its debut year, PITCOM organised an exhibition on computer-based aids for people with disabilities opened by Sir George Young MP, then Parliamentary Under-Secretary of State at the Department of Health and Social Services. The following year we were more ambitious with an exhibition of Computers in Schools. Relays of children from over 30 schools manned 26 systems in the Upper Waiting Room of the House of Commons, visited by over 120 MPs. The House then had only three ladies toilets. The Sergeant at Arms said “never again”. 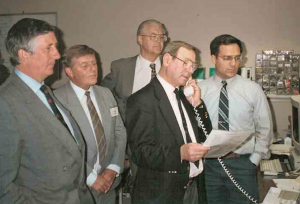 PITCOM also organised its first seminar on “The Freedom of Broadcasting” that year addressed by, among others, the Home Secretary (Rt Hon W Whitelaw MP) and Mrs Mary Whitehouse. It was the first public political discussion in the UK on the new Cable TV technologies that were expected to transform the world of Broadcasting. It raised issues, including responsibility for the effect of content on children, that still reverberate today. In 1984, after a meeting on the effects of piracy on the nascent computer games industry, it was agreed that “something must be done” but PITCOM should not compromise its neutral position by taking a lead. Those round the table decided to support the formation of a British Computer Society copyright committee to look at the issues. That committee delegated a sub-group to produce a report. It never did. Instead the participants formed the Federation Against Software Theft and organised the campaign that led to the Copyright (Computer) Amendment Act in 1985. IBM loaned the main auditorium of its South Bank Centre to PITCOM for a daylong seminar on IT Skills Shortages in 1986, organised with the assistance of the IT Skills Agency and my staff at the National Computing Centre. That too opened debate on issues still reverberating today. PITCOM supported the first Women into IT Campaign, decided at that event. After I presented the feasibility study, Minister Eric Forth MP re-ordered the pages of his prepared response. Without changing a word he turned a “definite maybe” into “Yes”. I will never forget the changing expressions on the face of his DTI “minder” in the audience. We then used £500,000 from DTI to leverage over £2 million from PITCOM members to organise information, advice and a kite-marking programme for careers activities and returner programmes. We raised the proportion of girls applying for IT-related degree course from barely 10% to over 25%. It then fell back because of the lack of ongoing support for the careers service. Affirmative action needs to be sustained over time. 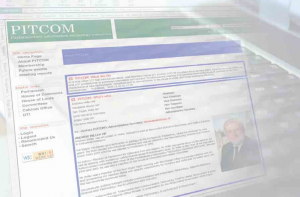 In 1993 PITCOM began organising fringe meetings at the party conferences and in 1994 it adopted EURIM (the European Informatics Group, now retitled The Digital Policy Alliance) as its “paramilitary wing”. EURIM was formed to not only research policy but secure action where it found consensus – thus allowing PITCOM to remain neutral. John McWilliam MP, on the Committee of Privileges and later a Deputy Speaker, managed the relationship. 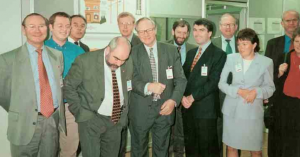 PITCOM’s overseas study tours included New Jersey, New York and Washington to look at the politics of multi-media in 1995 during the run-up to the reform of the Federal Communications Commission. Two years later we embarked on a tour of Sweden, Finland and Germany which demonstrated how the rest of Europe was learning from our mistakes, not just what we got right during the brief period when we led the world on telecoms policy. 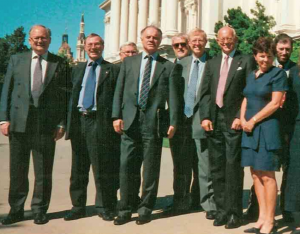 During a 2003 visit to California, we learned that UK and EU technology policy was regarded “at the far-far end of the red-eye, even more out of touch than the Federal Government in Washington”. Just before PITCOM’s 25th Birthday it become necessary to transition to a conventional all-party group within a regulatory structure. After many years, both Frank Richardson and I resigned to make way for younger blood to lead the organistion. For those interested in reading further, there is a history of PITCOM here and a shorter Wikipedia entry here.